Kevin McCarthyCollin Zych finished second in the 2015 Decathlon. 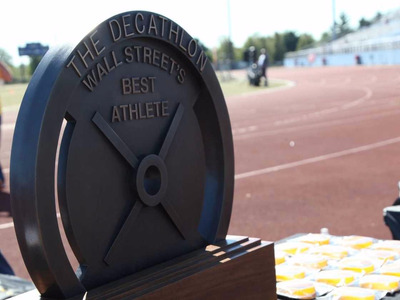 “Wall Street’s Best Athlete” will be crowned on Saturday on June 11 at The Decathlon, an annual event that brings together the fastest and strongest people working in finance. The event raises money for pediatric-cancer research and treatment, and, a you might expect, gets very competitive. 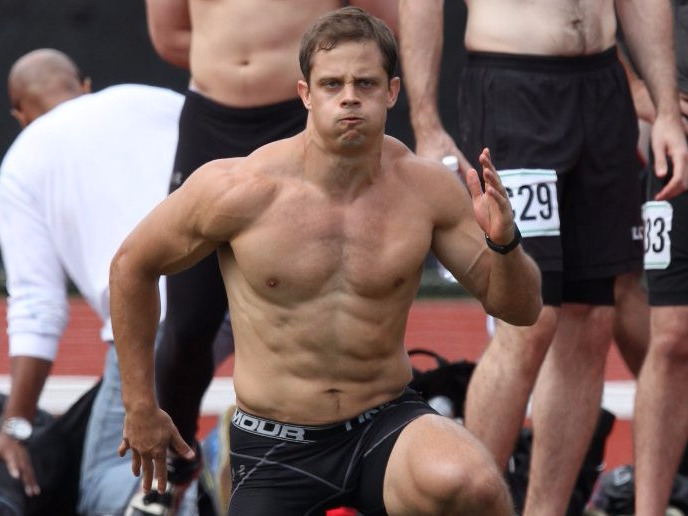 Competitors compete across ten events, including a 800-meter run, a 500-meter row, bench press, football throw and a 40-yard dash. Julia La Roche, a former Business Insider reporter now working at Yahoo Finance, is taking part this year (you can sponsor here here). She asked some of the previous participants from the event to share their workouts, and ran their answers last year. Given the event is taking place again on Saturday, we thought we would run the story again to highlight how hard the competitors train. Take a look. Their training regimes are pretty intense. Laura Placentra, Citi. 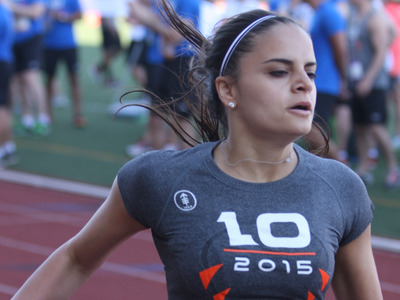 Wall Street's Best Female Athlete 2015. 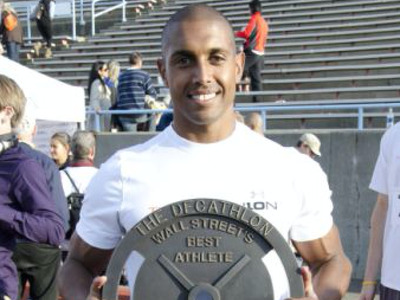 'In the months leading up to the Wall Street Decathlon, I trained five to six days a week, focusing on cardio and upper-body strength training. 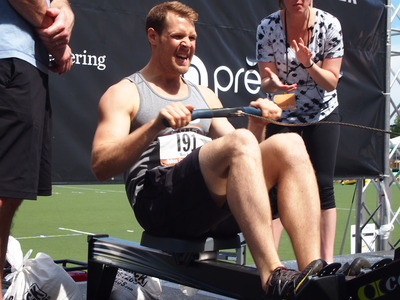 My regimen included boxing, rowing, stationary biking, paddle boarding, and free weights. I do Pilates twice a week for flexibility, core strength, and injury prevention, and I also box on a weekly basis. 'As for weight-room activities, I can't recommend box jumps enough. They're unmatched for improving quick-twitch strength and explosiveness for sprinting. Collin Zych, Greenhill Cogent. Second place in 2015. 'I work out six days a week, usually one to two hours during the week and two to three hours each weekend day. During the week, I work out in the mornings -- usually get up around 5:30. My work hours sometimes get a little crazy, so this is the only time I know I have available. 'Also, nothing beats the post-workout feeling as I sit down at my desk in the morning. I like to schedule a workout on Saturday morning, mostly to keep myself from drinking too much on a Friday night. If my body is too sore, I will take a day off. I used to try to train through the aches and pains, but it just isn't smart. The last thing I want to do is get hurt. 'I belong to a local CrossFit gym, CrossFit Deep, where I do most of my lifting. I don't always agree with their programming -- burpees are stupid -- but I can lift heavy and drop weights and be loud there. There are also some great athletes to compete with. 1. I do 2-3 days of sprint work per week. This consists of jumping/explosiveness drills, flexibility work, and 100% effort starts and short sprints. I do this at the local track or in parking garages (great for hill sprints) if I'm stuck at the office. I'm terrified of not being fast. It's weird. 2. I will spend a little time on 'skills' every day -- things like rowing form, jump rope double-unders, handstand holds. My most recent projects are muscle-ups (a pull-up into a dip on hanging rings). 3. I try to do some dedicated conditioning 2-3 per week. To me, this means running (treadmill interval sprints, 100-yard sprints, etc.). I also do CrossFit circuits as part of the gym's programming (refuse to call them WODs or METCONs) which incorporate combos of lifting, running, jumping. Will McHale, Axiom International Investors. 'I try to work out six or seven times a week. My routine involves some type of interval cardio and some weight lifting. I roughly split the weight sessions between upper body and lower body, but do my best to keep my training balanced and hit the whole body every workout. 'My cardio sessions are always interval-based. It is way more efficient than just jumping on the treadmill for an hour. Keeping the workout intensity high is a great way to maximise time. I also think it is important to mix things up. The body can plateau when you are doing the same movements, reps, and sets over and over. Also a boring workout is more likely to be a skipped workout. Thomas Davis, Brown Brothers Harriman. 'As a father, husband, and person who spends a lot of time travelling around the country, I have to get pretty creative finding time to structure a normal training routine. 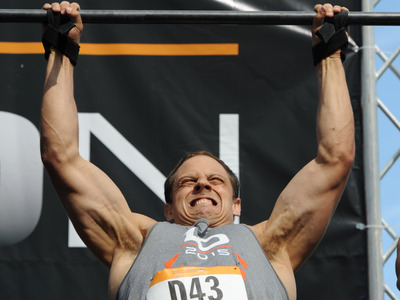 In my last Decathlon, my pull-ups and dips were absolutely miserable and really hurt my overall results. 'Consequently, those two events have been my primary focus, and fortunately I can train for them in about every hotel gym. 'That said, finding motivation to really push myself in a hotel gym is challenging, so I usually create a mini crossfit-style WOD -- workout of the day -- and compete against one of my colleagues I'm travelling with. 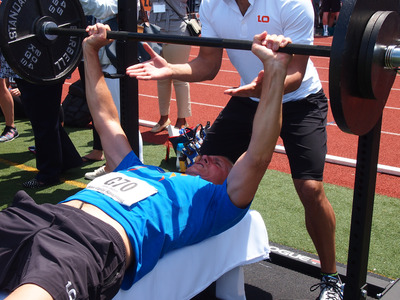 For me, creating a competitive training environment is the best way prepare for the intensity of the Decathlon. John Osbon, Osbon Capital Management. 'Do anything. Run, jump, lift, and mix it up. Throw in ballet class when you can. Add some skill if you have it. Just move every day, taking one day off a week. As a bonus tip, train with a 27-year-old. They can do almost anything very well and if you follow them you will, too. Max Osbon, Osbon Capital Management. 'Set specific targets and find a way to reach them. It's not enough to just go to the gym every day. Once I pick a category, I research on Reddit Fitness what the experts say about form, stretches, frequency, set, and reps.
'Stick to the plan, because it can takes months to really improve and change your muscle memory and strength composition. I will spend 75% of my efforts on that one area of improvement while the rest is just maintenance for the other categories. Justin Nunez, TPG Capital. 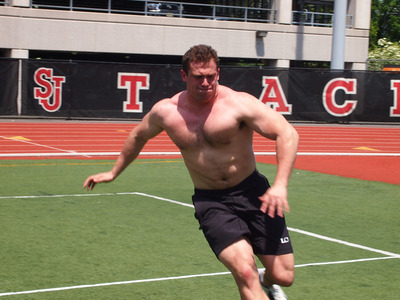 Wall Street's Best Athlete 2011. 'I try to keep my approach simple. That means ensuring I dominate the events that I'm supposed to dominate. My goal is to either finish first or to at least be in the top five in anything focused on speed or body weight -- the 40-yard dash, 400m run, pull-ups, dips. 'To do that, I need to be running, at least five days a week, preferably uphill, and lifting just as often. One of the benefits to living in the Bay Area is that there is no shortage of hills or mountains. I can do most of my 'track' work on steep hills, so when competition day comes, the events seem much easier. 'On the strength side, I try to get some form of pull-ups or dips in every day. I think most fitness professionals would disagree with this, but it's what works for me. One thing that has always been consistent in my training is that I have to get it done first thing in the morning.